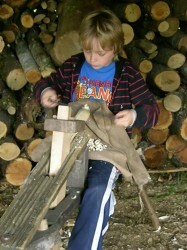 Why not combine your holiday at Bamff with learning new skills? Open to adults and children alike, The Scottish Woodland Skills Centre run a wide range of woodland craft and skills courses through out the year. All the courses are designed to strengthen the connection between people and the Scottish native woodlands and promote the sustainable use of woodland materials. We also have bee hives on site and offer a bee keeping course for beginners. Special Offer: 10% off the price for visitors to the Old Brewhouse.